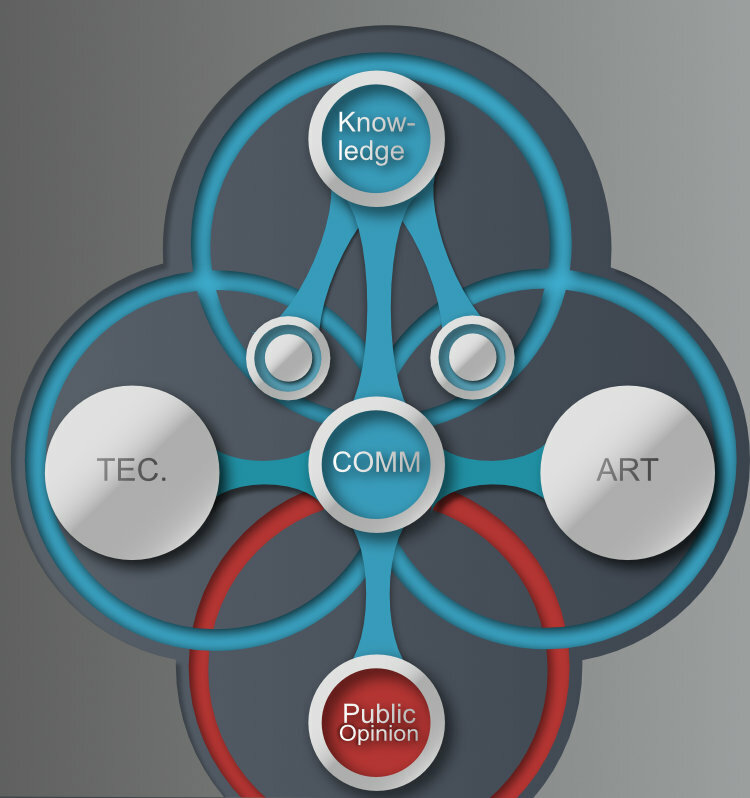 The knowledge that arts and technologies possess from each other, is merely based on popular writings and public opinions. While art and technology benefit from public attention in financial terms, it also causes fear. This irrational fear is quite dangerous and can result in “Iconoclasm” of different sorts. Technology tends to be seen controlling humanity and destroying nature, while art is viewed as entertaining the elite with taxpayers money. People tend to fear and destroy what they don`t understand, and this lack of understanding has nothing to do with intelligence, but instead with education. A collaboration between art and technology could help improve public opinion as well as drive innovation. Scientific and technological skills are not the only forces driving innovation. Creativity and the involvement of society play a major role in the innovation process and its endorsement by all. In this context, the Arts serve as catalysts in an efficient conversion of Science and Technology knowledge into novel products, services, and processes. 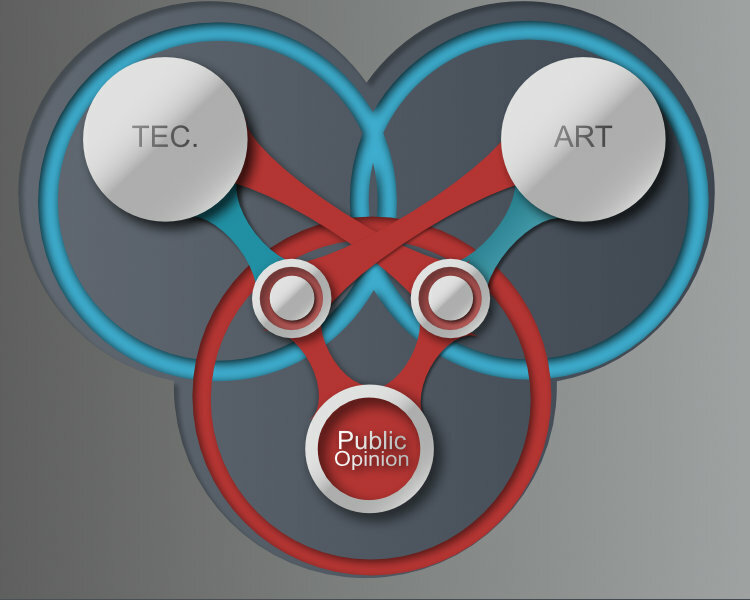 a collaboration between art technology could help to built discursive reasoning in public perception and pave the ground for ethical and moral discussions on the base of disambiguation, that are not fueled by misunderstandings or misinterpretation of artistic ideas. For for a sufficient understanding of technology, it is necessary to obtain a basic understanding of its knowledge (for example what an algorithm is and does it is necessary to obtain a basic understanding of computer science). This should be implied by the term “artistic research”. For understanding art tt`s not necessary to become an artist . But there should be an impulse to learn about cultural history, aesthetics and its discursive structure: the knowledge of art is not the knowledge of the artist! Convolutional Neural Networks (CNN) have rapidly developed in recent years and now play a major role in the fields of machine learning and artificial intelligence (see page five). The theoretical foundations for these software-models originated from the field of computational neuro-science. CNN models are programmed to run through self optimization processes by evaluating large amounts of data. This "learning process" enables them to independently classify new, unlabeled data. Currently CNN technology is used by scientists to explore fields of art and creativity - neural representations separate and recombine content of style of arbitrary images, providing an algorithm for the creation of artistic images. For example, the aesthetic style of Van Gogh can be applied to any other digital image. CNN Models are applied to look for similar objects, and even the human body, in large painting-databases of art institutions. CNN-Systems are also capable of generating photorealistic pictures out of drawings.These innovations give a intriguing new perspective to creative arts research, and open up the field for an interdisciplinary discussion between science, technology and arts. The research project 'Artificial Art – Machinic vision beyond classification and representation' establishes a base for understanding these groundbreaking technologies for the wider public, that tends to be suspicious towards such developments. The research and practical solutions in the field of machine learning has lead to new insights in how we perceive art and interpret the meaning of pictures. This development can be seen as a comeback of Max Benses formal Theory of aesthetics in an applied way. Methodologies such as, critical feedback sessions, white paper reports and symposiums are building the base structures to present research outcomes. This will allow for an active discussions between science, technology and aesthetics to enable a critical reflection of the subject matters on both sides. The research project proposes to develop a VR-Data Visualization to guarantee a quick understanding of how a CNN works with the aim to overcome the very steep learning curve for the user. The Project will provide a cost effective infrastructure to enable researchers of all fields to experiment with CNN. This practical side of the research program will focus on actual developments in CNN related to art. The interest of this endeavor lies in the integration of aesthetic ideas and artistic practices into technical work-flows. Such experiments should result in practical services for museums and art historians to help them handle large Art-Datasets. At the same time these sets should enable artists to develop further ideas with CNN connected to such data and use CNN as a creative tool. It is less the idea of the project to produce groundbreaking technological algorithms, but rather embed such theories into a culture-theoretical context and make them useable for artists. The project will make functions of CNN transparent to non-experts allowing for wider public discussion and critical reflection. This should enable technicians to gather creative impulses and result in novel products that can also be used by creative and entertainment industries. Obtaining Data, Training Networks and using the final results should therefore seen as creative processes, not merely a technological procedure. Such processes will be documented in digital form and the outcome will be presented in exhibitions and other public art-contexts. Finally, the three levels are not separated from each other and represent intersecting modes of operation, that form a dynamical feedback-system [see diagram]. The research project will serve as a foundational methodology for creative practice and complex systems research. The experiences and methologies of this interdisciplinary project can be used as a blueprint for underlying structures of future projects. To this date, current research on CNN and art operate on the semiotic level of indexicality; the content is an object that can be classified by machinic vision. However, if art exceeds this idea of mere representation since modernism, what if the indexicality is reversed and these images are the constitution of reality itself? In 1977 Douglas Crimp curated a very influential art exhibition in New York called “Pictures”, he didn't focus on the media of the exhibited pictures (paintings, photographs, films etc.) but on their representation. Through this act of contextualization the difference between pictures of the cultural industries and art was blurred away. The ambition of art as an autonomous act from an artist was questioned and held up for reappraisal. Therefore CNN provides interesting concepts and delivers powerful tools for such an approach towards art and opens up new relevant questions for culture and society. A return to the extrinsic point of view obviously becomes necessary: the technological and social evolution of automata. Clockwork automata, but also motor automata, in short, automata of movement, made way for a new computer and cybernetic race, automata of computation and thought, automata with controls and feedback. The configuration of power was also inverted, and, instead of converging on a single, mysterious leader, inspirer of dreams, commander of actions, power was diluted in an information network where "decision-makers" managed control, processing and stock across intersections of insomniacs an seers [...] [..] But when the frame or the screen functions as instrument panel, printing or computing table, the image is constantly being cut into another image, being printed through a visible mesh, sliding over other images in an "incessant stream of messages", and the shot itself is less like an eye than an overloaded brain endlessly absorbing information: it is the brain-information, brain-city couple which replaces that of eye-nature. Gilles Deleuze: Cinema 2, The Time-Image, London 1989, S.264. In cultural and media studies, the “digital movement-image” is usually analyzed as a rendered image sequence. Such reduction to pure aesthetic, leaves the special technological and production aspects completely out of focus. For the 3-D movie images differ neither structural nor technologically from CAD construction, scientific computer simulations, architectural models and computer games. This work is an attempt to define a field of research and to develop the necessary tools to help interdisciplinary discourses in building critical. The digital motion picture is regarded as a special form of knowledge, which consists of different scientific and technological fields. The work follows the idea of Deleuze by describing the motion picture as a form of thinking, rather a form of perception. In his cinema books there is also an underlying apparatus- theory, based on ideas owed by Gilbert Simondon. Thus the ideas of Simondon were much more elaborated; it was decided to update his theory with the technological and theoretical developments, which took place after he wrote his book in the 50s. This is the topic of the first part of this dissertation. With this enhancement, the flexible design of his system came to fruition, which allows structural changes, without losing its internal dynamics. The techno philosophy of Simondon made it possible to obtain the methodological toolset so that the “digital movement- image” can be analyzed adequately. • The development of the “encyclopedia”, that tends toward a form of “visual knowledge”. • The development of formal-logic and its associated ideologies. • The development and recurrence of a universalism, that treats the world like a technological function. • The digital “break”, which is derived from the hierarchical tensions between generations and leading to the “counterculture” in America. 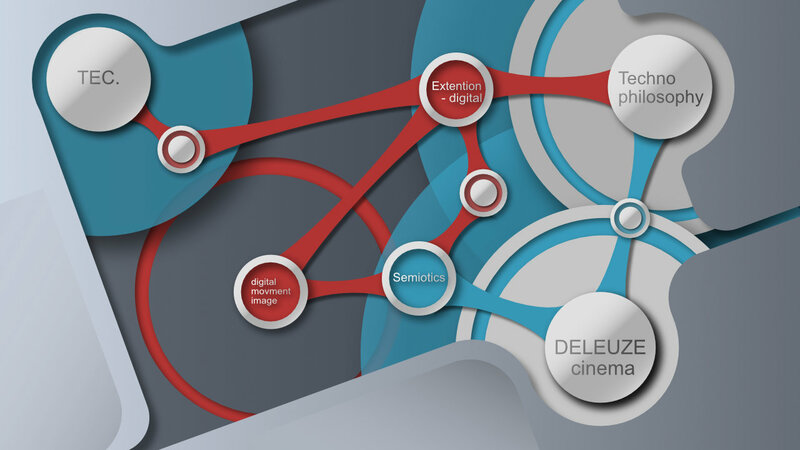 The third part follows with an semiotic analysis of the digital movement-image Based on the structural difference between the digital- movement images and the Cinema of Deleuze, the constituent subject is stated as mandatory. This is in line with the ideas of Simondon, which posits that it is always a subject who is responsible for the function of technical ensembles. The digital movement- image can never be thought without an subject, because its lack of the deleuzian “virtual” or plurality. The digital movement- image exists in a void, which is the essence of its structure whereas the cinema of Deleuze is dwelling in an infinite space filled with pictures.